Synopsis: It could happen tomorrow . . .
Review: 4.5 Stars - Ashes, the first book in the trilogy By: Ilsa J. Bick is a chilling story that’ll keep you on the edge of your seat. 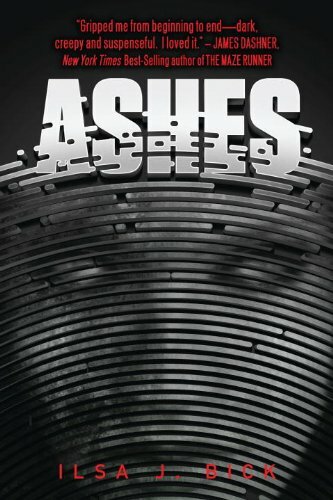 Stunning, bleak, thrilling, fantastic and strength quickly come to mind when I think of Ashes. Set in current day, Bick sets the scene and begins to tell the background of our female lead character – Alex. She’s on a journey to say a much needed good-bye before time runs out. Alex is strong from the word go. She knows how to survive in the wilderness and is one smart girl. I was impressed with her knowledge of the outdoors and felt that Bick choose and envisioned the perfect character to be the voice of her story. With a world that changes in the blink of an eye it’s up to Alex and her young companion Elllie to find a way to survive in the wilderness and the quickly changing world. With not many supplies and the weather changing the two must work together and think fast to try to figure out what’s happened to her part of the world… or is it more than just the world around her? When trouble finds Alex and Ellie, Tom comes to their rescue. He’s scarred in a much different way than Alex is, but both can see and feel the others pain. They know what the other is going through without truly knowing the facts of their pasts. The two together know that they must come together to get through whatever they are facing in the new dangerous and scary world, yet at the same time they each understand that it’ll be harder than even they believe to survive. Bick’s writing made this book very visual for me. It has its fair share of disturbing scenes and even more disturbing are the hints of what might be in the minds of others. In Rule for instance, a town that takes in survivors… well, they pick and choose who they are going to take in based on what they might be able to offer the community. The town alone was horrible. When children, more so girls, are few and far between, it’s easy to come up with some horrible and nasty ideas to what some people might want them for. With many ups and downs and twists and turns, I felt for Alex and the decisions she had to make. I had no idea what Bick or her characters might be forced to face next. To say this is a wonderful story might not sound right with how bleak things look for our characters, but it truly was a book I will never forget. Post Apocalyptic/Dystopian novels, when written as well as this are ones that shouldn’t be passed by. The thought of a world such as this has stuck in my memory and has left its mark. Fans of the YA and post apocalyptic/dystopian genre’s should pick up this title for the writing and the strength of a memorable female lead. It’ll stick with you, as it’s stuck with me. However, just be prepared for a cliffhanger that’ll make you reread it and flip the pages back and forth thinking your book is missing a page or two. I seriously blinked in surprise and shock over where we were left, so Bick, if you’re reading this… hurry with book two please and Thank You. Enjoy! ETA: Ria left a great comment below and I do partially agree with her take on this title being Post Apocalyptic, so I've changed up my review just a tad to reflect this. While I do still believe it has a bit of a Dystopian feel to it, (in my opinion) I've left that as well. I can see it being both actually and I thank her for her input. I really enjoyed this book as well. Right now I'm reading her contemporary novel, Drowning Instinct, and that book is great, too even though it's in a different genre. LOVE the new layout, by the way!! I disagree that this book was dystopian (post-apocalyptic, definitely, but since a dystopia is a society that looks perfect in theory but is actually oppressive and crumbling from the inside, that description really doesn't fit the story in "Ashes"), but I do agree with the rest of the review. I normally avoid zombies like the plague, but after reading one of Bick's previous novels, I wasn't about to let this one pass me by. It's wonderfully atmospheric, creative, and I love Bick's engaging writing style. This is moving up my TBR list very fast! Thanks for the great review. I can't wait to read it now. This sounds really good! Nice review!!! This is the first time I've heard about Ashes, but it sounds like something that's worth looking into. The writing and the memorable female lead that you mentioned definitely intrigues me! Thanks for bringing this book to my attention, Lisa! I'm severely disappointed that I never picked this book up, especially with the high praise it's been receiving lately. I love your review--I think you described it all so perfectly. Sweet! Been wanting to read this one! Wow, great review! And I love your blog, the background is lovely!